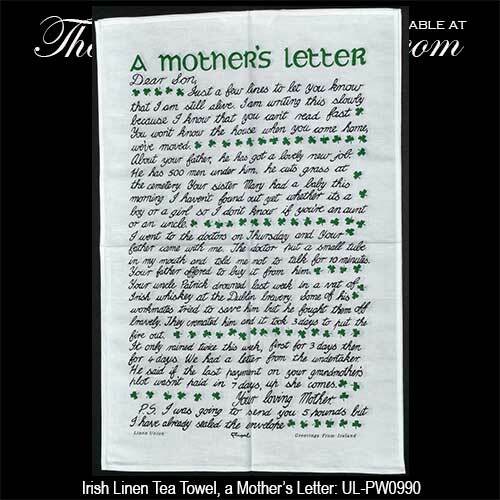 This linen tea towel features an Irish mother's letter to her son. Sorry, the mother's letter tea towel is now sold out. Please note the similar design from Liffey Artefacts. Just a few lines to let you know that I am still alive. I am writing this slowly because I know that you can’t read fast. Your won’t know the house when you come home we’ve moved. About your father, he has got a lovely new job. He has 500 men under him, he cuts grass at the cemetery. Your sister Mary had a baby this morning I haven’t found out yet whether it’s a boy or a girl so I don’t know if you’re an aunt or an uncle. I went to the doctors on Thursday and your father came with me. The doctor put a small tube in my mouth and told me not to talk for 10 minutes. Your father offered to buy it from him. Your Uncle Patrick drowned last week in a vat of Irish whiskey at the Dublin brewery. Some of his workmates tried to save him but he fought them off bravely. They cremated him and it took 3 days to put the fire out. It only rained twice this week, first for 3 days then for 4 days. We had a letter from the undertaker. He said if the last payment on your grandmother’s plot wasn’t paid in 7 days, up she comes. Your loving mother. P.S. I was going to send you 5 pounds but I have already sealed the envelope. This Irish tea towel features green and black text with green shamrocks on 51% Irish linen . 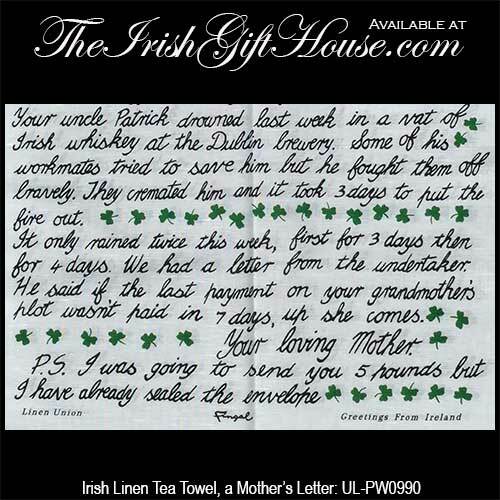 The towel features an Irish mother's letter to her son and it measures 19" x 30". 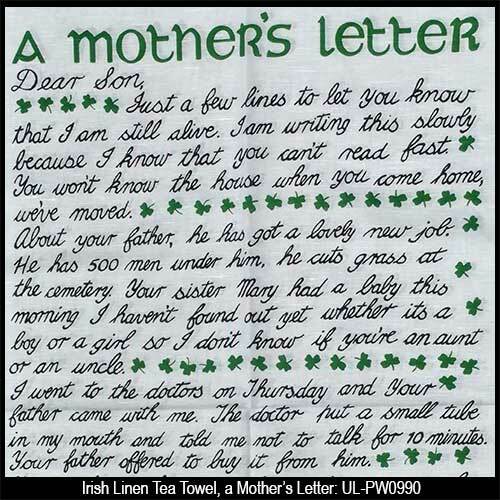 Irish tea towel features a letter from an Irish mother to her son.